Mildred (Millie) Jeffrey was born on Dec. 29, 1910, in Alton, Iowa, the eldest of seven children. A life long socialist Mildred McWilliams Jeffrey, died in 2004 in a Detroit nursing home, age 93. Millie McWilliams graduated from Minneapolis Central High School. She received her B.A. in psychology at the University of Minnesota, where she immersed herself in the socialist and progressive movements. In 1934, she received a master's degree in social economy and social research from Bryn Mawr. She joined the campus YWCA, which at the time was considered a controversial group for sponsoring interracial dances and attempting to integrate local restaurants. After earning a graduate degree at Bryn Mawr College in 1934, she married a union organizer and Socialist Party USA member Newman Jeffrey, and they traveled the country, organizing textile workers. They divorced in the late 1950s. With the passage of laws promoting labor unions, Millie became an organizer for the Amalgamated Clothing Workers in Philadelphia and later the education director of the Pennsylvania Joint Board of Shirt Workers. That work began in the 1930s, when Millie, a fiery young socialist, organized clothing workers in the South. In 1944, she became the first director of the UAW’s Women’s Bureau, working to secure child care and transportation for the quarter-million Riveting Rosies who had swelled the UAW’s ranks – and teaching the women the parliamentary and bureaucratic skills they needed to have a role in their union. Mildred Jeffrey joined the NAACP in the 1940s and marched in the South with Dr. Martin Luther King, Jr. in the 1960s. Former Executive Secretary of the Detroit Branch of the NAACP, Arthur Johnson, commented that ‘in the civil rights movement, she knew how to fight without being disagreeable’. Meyerson explains Jeffrey's role as an emissary from United Auto Workers leader Walter Reuther to organizations including National Council of Churches, Cesar Chavez's United Farm Workers, National Association for the Advancement of Colored People, Students for a Democratic Society and events and movements such as Earth Day the Civil Rights Movement and the 1963 March on Washington. By the end of World War II, Millie had become one of a number of extraordinarily talented staffers whom Walter Reuther hired to help him mold the auto workers into the greatest force for social democracy that America has ever known. Under Reuther, the UAW became the anchor tenant in the house of postwar liberalism. Its contracts, and those of the steelworkers,set the standard for the entire manufacturing sector, and for the three decades after World War II, working- class living standards in the United States rose just as steeply as upper-middle class living standards – an equality of economic opportunity that America has experienced only during this period of union strength. More than that, though, the Reutherites saw it as their duty to bolster newer movements for social equality. They provided political and material assistance to the civil rights movement (it was the UAW that paid for the signs and sound system at the great 1963 March on Washington), for Cesar Chavez’s farm workers, for the campus left in the early ‘60s, for start-up feminist organizations and the first Earth Day. And for several decades, Walter Reuther’s emissary to these groups was Millie Jeffrey. In the 1950 and 60s, Jeffrey was a Democratic Party National committeewoman from Michigan. In 1960, she helped campaign forJohn F Kennedy, as a Michigan member of the Democratic National Committee. After mobilizing the Michigan Democratic Party behind JFK in 1960, she then reportedly pushed JFK to initiatethe Peace Corps. Millie Jeffrey quit the DNCthe late 60s to protest the Vietnam War and to work for Robert Kennedy. She went on to co-found the National Women’s Political Caucus in the 1970s. According to Harold Meyerson Millie Jeffrey was very influential inside the Democratic Party and the party's National Women’s Political Caucus. In the early ‘70s, during her final years on the staff of the United Auto Workers, she helped found the National Women’s Political Caucus and launched a decade-long campaign to have Democratic National Convention delegate slots divided equally between men and women. Keynote speakers included Washington, DC, Mayor Marion Barry, Democratic Socialists Organizing Committee leader Mildred Jeffrey and Democratic Socialists Organizing Committee chairman Michael Harrington. According to Democratic Socialist Organizing Committee founder and chairman Michael Harrington, the influence of the group is disproportionate to its size because of the positions held by some DSOC members within the Democratic Party. In the 1970s Millie Jeffrey was a leading activist in the Women's International League for Peace & Freedom. Millie Jeffrey traveled to the Soviet Union in 69/70. In 1974 she traveled to China. In 1995 Millie Jeffrey accompaniedDebbie Stabenow to China. In 1962, Millie Jeffrey arrangedfor her daughter, Sharon, and a group of politically active University of Michigan students, including Tom Hayden, to use an UAW campon Lake Huron. The students issued the Port Huron Statement, the founding document of Students for a Democratic Society (SDS). When SDS was formed, the children of UAW staff attending the University of Michigan played an important rolein forming one of SDS's first and strongest branches. They included Sharon Jeffrey, daughter of UAW official Millie Jeffrey, Leslie Woodcock, daughter of UAW vice president Leonard Woodcock and Barry Bluestone, son of Irving Bluestone, Reuther's key administrative assistant in the 1960s. In 1981 Mildred Jeffrey was a Vice President of Independent Voters of Illinois-Independent Precinct Organization. In late 1984, more than 700 people attended a conference at Princeton "Socialism in America" to mark the centenary of the birth of Norman Thomas. The conference was organized by historians Gary Gerstle, Peter Mandler and Sean Wilentz. Millie then became “the unelected leader,” in the words of her co-conspirator Joanne Howes, of a committee of seven Democratic women promoting the idea of a female vice presidential candidate on the 1984 ticket. “By the fall of 1983,”recalls Howes, “we came to the conclusion that the right person was Gerry Ferraro” – then an obscure member of Congress from Queens. That required augmenting Ferraro’s visibility and bona fides, and as a result of “Millie’s strategic thinking,” says Howes, the group successfully pressured the party and Walter Mondale to make Ferraro chair of the convention platform committee. The rest is herstory. In 1989 Mildred Jeffrey served on the Board of Directors of Women for a Meaningful Summit. 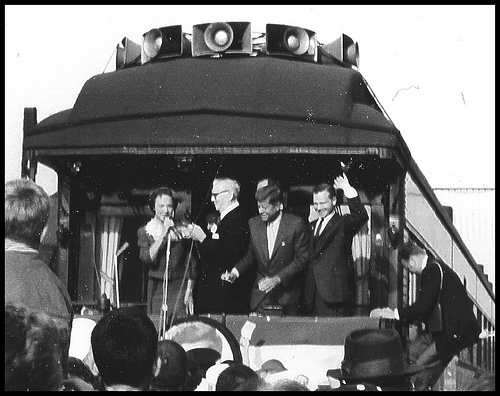 As well as accompanying Stabenow on trips to the Soviet Union and China, Millie Jeffrey became a friend and political supporter of the Michigan politician. In 1994 Millie Jeffrey was a leaderin the Stabenow for Governor Committee. Millie is the "political godmother" for many of us, and we are extremely grateful for her love and support. In 2000 Millie Jeffrey was partof Team Stabenow-actively supporting her friend's successful bid for United States Senate. Jeffrey was active in the elections of U.S. Senator Debbie Stabenow, Representative Carolyn Cheeks Kilpatrick and Michigan's first female governor,Jennifer Granholm. After helping create the National Women's Political Caucus in 1971, Jeffrey became a leader on the Democratic Party committee that ensured that half the delegates to its 1980 convention were women. She helped propel the careers of many women in politics, including the governor of Michigan, Jennifer M. Granholm, a Democrat. Patricia Schroeder, a former United States representative from Colorado, said, "Millie is the political godmother for many of us." 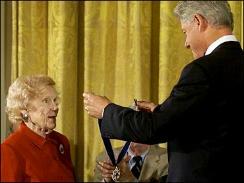 In 2000 President Bill Clinton presented15 "illustrious figures", including Millie Jeffrey, with the nation's highest civilian honor bestowed by the U.S. Government, the Presidential Medal Of Freedom, with a citation, saying those awarded "have helped America to achieve freedom." Other honorees included included retiring Jesse Jackson, Marian Wright Edelman, Senator Daniel Patrick Moynihan (D-NY), former U.S. Sen. George McGovern, economist John Kenneth Galbraith, retired Gen. Wesley Clark, and posthumously Rhode Island Sen. John Chafee. When Millie died last week, both Michigan Gov. Jennifer Granholm and Sen. Debbie Stabenow (DMich.) told the media that they would not be in their current positions without the decades of work that Millie had put in on behalf of equal opportunities for women. Her energy was the stuff of legend. Determined to attend the inauguration of Madeleine Kunin as governor of Vermont, which occurred in the middle of the 1981 air traffic controllers’ strike, the then 70-year-old Millie traveled from Detroit to Montpelier by bus. Two years ago, at age 91, she bused down from Detroit to Cleveland to witness Joan Campbell’s swearing in as mayor. Millie Jeffrey was inductedinto the Michigan Women's Hall of Fame and was an original board member of the Michigan Women's Foundation. She served in various leadership roles in a wide variety of national and State organizations such as the Michigan Women's Political Caucus, the Coalition of Labor Union Women, Americans for Democratic Action, National Abortion Rights Action League, Voters for Choice, EMILY's List and the American Civil Liberties Union. She served on the peer review board of Blue Cross and was an active member of the First Unitarian Universalist Church in Detroit. Millie Jeffrey was a member of Democratic Socialists of America. From Chicago DSA'sNew Ground. Eliseo Medina, an Executive Vice-President of the Service Employees International Union, was elected an Honorary Chair of Democratic Socialists of America. Medina was elected to fill the vacancy created by the death of Millie Jeffrey earlier this year. The election was a unanimous vote of DSA's National Political Committee. Millie Jeffrey co-foundedboth the Democratic Socialists Organizing Committee in the 1970s and the Democratic Socialists of America in 1982. Millie Jeffrey addressed a "special unity convention session" on day two of the Democratic Socialist Organizing Committee/New American Movement Unity Convention in Detroit March 21/22 1982, that resulted in the formation of Democratic Socialists of America. Millie was also my mentor and my pal for 25 years. About 10 years ago she surprised me by saying that she had decided to “limit her activities.” “You’re slowing down?” I asked. “ No, just confining my work to peace and justice.” Now that’s really kicking back! In celebration of Women’s History Month in March 2006, the Michigan Veteran Feminists of America presented the documentary Passing the Torch on March 25 on PBS (WTVS, Channel 56). The documentary, narrated by Lily Tomlin, explored Michigan women’s motivations to participate in "one of the most profound social movements of the 20th Century." Detroit-area feminists were active in the women’s movement of the late ’60s and early ’70s, and they joined the national VFA organization in the fall of 2000 to ensure the gains that they helped to make on behalf of women remain in place today. Through interviews and oral histories, the documentary recalls the struggles of these engaging activists to establish domestic violence shelters, pass legislation to promote more accessible child care and gain reproductive rights. Luminaries such as former Michigan First Lady Helen Milliken, Erma Henderson, the first African American woman elected to the Detroit City Council, UAW executive Millie Jeffrey, Senator Debbie Stabenow (D-MI), and Governor Jennifer Granholm "reminisce about the protest marches, consciousness raising sessions and the excitement they felt when opening doors that had been closed to women." Millie Jeffrey played a major role in many groups, including the Coalition of Labor Union Women, Emily's List, Americans for Democratic Action, the National Abortion Rights League, the American Civil Liberties Union. and on the peer review board of the Blue Cross. This page was last modified on 26 December 2017, at 17:33.